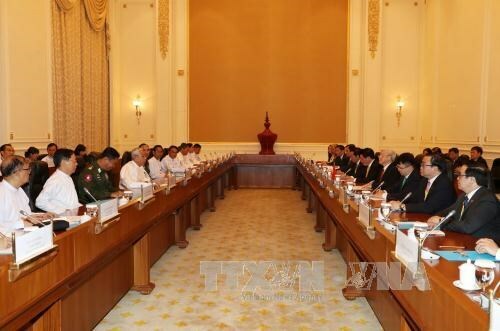 Nay Pyi Taw (VNA) – Vietnam’s Party General Secretary Nguyen Phu Trong and Myanmar’s President Htin Kyaw witnessed the signing of cooperation documents between the two countries after their talks in Nay Pyi Taw on August 24. The documents include a memorandum of understanding on cooperation in trade between the two Ministries of Industry and Trade; a cultural cooperation programme in 2017-2020 between Vietnam’s Ministry of Culture, Sports and Tourism and Myanmar’s Ministry of Religious Affairs and Culture; an agreement on cooperation and mutual support in customs between Vietnam’s Finance Ministry and Myanmar’s Ministry of Planning and Finance; and an agreement on education cooperation and diploma recognition between the two countries. At the following press conference, the leaders informed the media on the outcomes of their talks, showing their delight to see the rapid and positive development of the two countries’ traditional friendship and multi-dimensional cooperation over the past years. They noted huge potential for bilateral cooperation that should be tapped and informed that they agreed to establish a comprehensive cooperative partnership between the two countries and reached a consensus on orientations and measures to steer the implementation of the partnership with a view to asserting “a new milestone, a new height, and a new impetus” to push for the expansion of cooperation. They said they shared viewpoints on the issues pertaining to ASEAN, the region and the world, agreeing to work closely with other ASEAN member countries to maintain the bloc’s unity, reinforce its inner cooperation, and promote its central and guiding role in the regional and international architectures. President Htin Kyaw asserted that since establishing their diplomatic ties in May, 1975, the two countries are “always close friends”. The State visit to Myanmar by Party General Secretary Nguyen Phu Trong will chart a new course for the two countries’ cooperation, the President said, affirming that Myanmar always treasures cooperation with ASEAN member countries, including Vietnam.